a slightly different setup using some plastic stakes but the pressure inside the white drum has bent them due to pressure of the gas inside. This device consists of items purchased from the shelf,the collector is a 25 litre water storage drum turn upside and placed inside a larger plastic container,this could also be a 200 litre rubbish bin. Inside this diagram below,you can see a float, this is a piece of foam through which the plastic hose carrying the gas is inserted. This means this gas outlet pipe will always remain at the top of the water level inside the collecting drum. First fill the larger container to the top with water. You will need also to empty all the air from within the white collection 25 litre drum, and then sink it in the larger water filed container. The storage vessel shown had a small tap plug on the bottom side and I unsrewed this and then replaced this when the vessel had sank. This meant I had a container sunk and filled with water. I will be able get the gas straight from the drum as it sinks and this will also allow the raising and lowering of the gas collection drum as well. I then placed the foam float with gas line, which of course will float to the top water level inside the white collection drum. 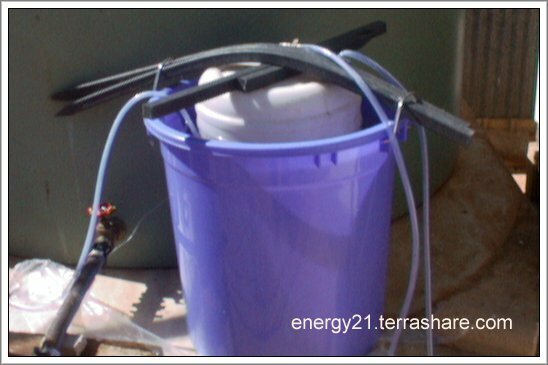 After a period of five days using the gas generator and solar power as described in previous articles the gas generator produced enough gas to lift the entire gas drum collector out of the water. 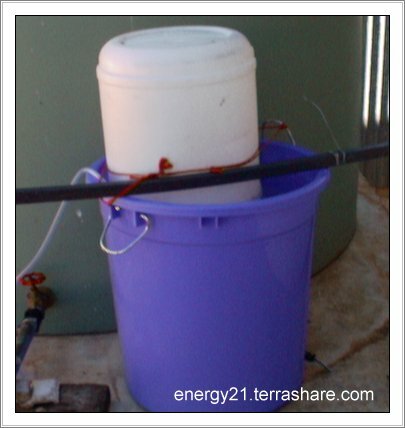 I am trying to source some cheap used 200 litre (44 gallons) plastic drums and to try something similar as described on this page.